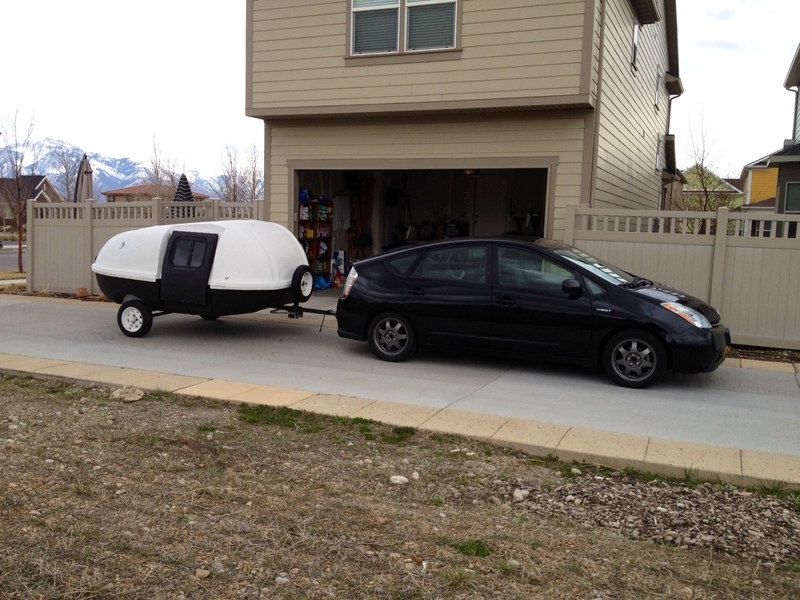 Last Thursday, Mike and I bought this cool teardrop trailer. I talked about it ad nauseum on Starling Travel with more photos. We are in the process of renovating it, so I’ll be posting photos of it here since Starling Travel is about TRAVEL, not trailer restoration. We’ve already stripped some of the peeling white paint (paradoxically, the black paint is sticking just fine and looks great). 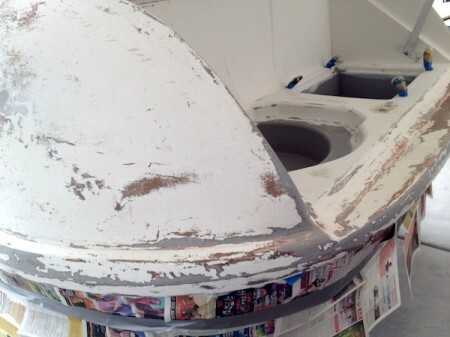 I’ll post photos of that in a couple of days once we get it down to the point where we can paint. After months of fighting a teardrop trailer obsession, I am finally a teardrop owner! So excited! 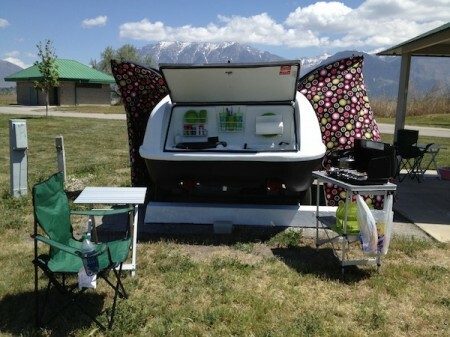 Our new teardrop trailer has an unusual bed platform. 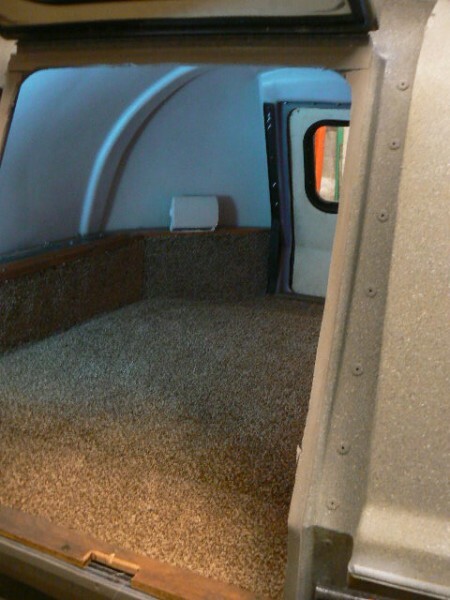 There is room for a queen bed in the sleeping cabin, but the bottom of the flooring is uneven. His bed platform looks amazing, but it is a bit out of my skills range right now. We need to get this trailer ready to camp in about a month and a half, so that addition will have to wait until I learn more woodworking skills. 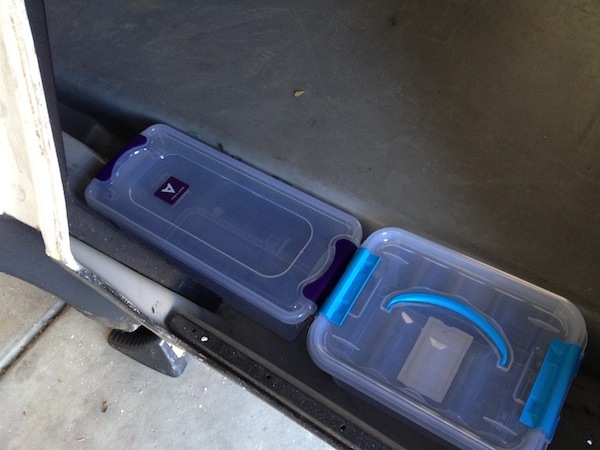 For now, we are leveling the bed platform by adding storage bins. 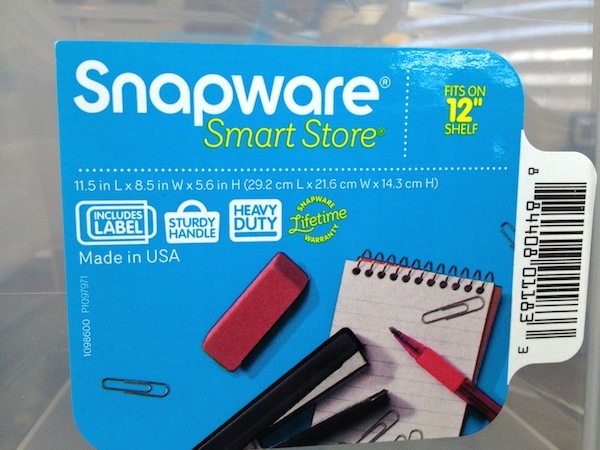 The blue bin is the Snapware Smart Store 11.5′ X 8.5″ X 5.6′. I found it on Amazon here: Snapware Smart Store System at Amazon.com. Here is the label for it as well. We haven’t tried putting the mattress over these bins and attempting to access them yet, so I can’t tell you if they feel lumpy under the mattress or if they are unable to support our weight. 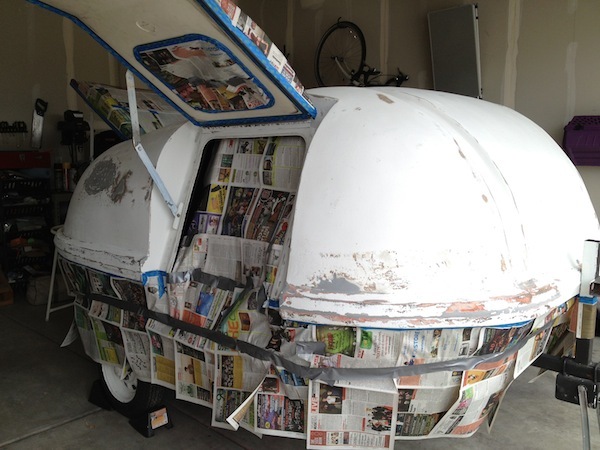 Once we take the trailer on its maiden voyage, I’ll update here. Update 05-07-12: These little boxes did an EXCELLENT job of leveling the bed platform. 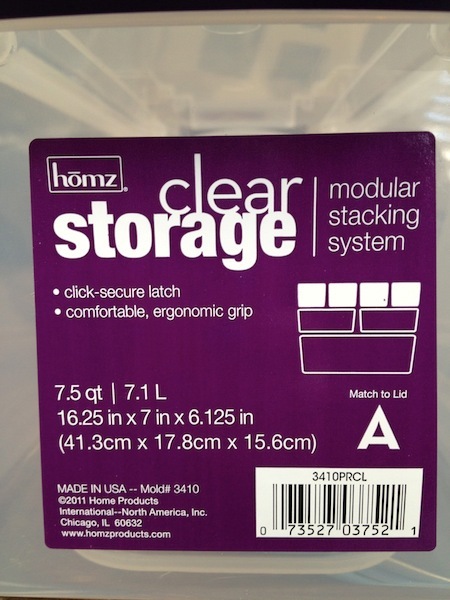 They were great for storing our camping gear like flashlights and tools. They didn’t feel lumpy. They didn’t move around. 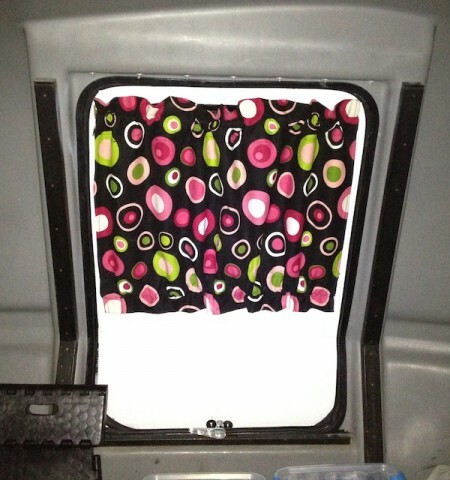 They were easy to access under the queen sized mattress we put in the cabin. I don’t think I’ll even bother with building a fancy platform like Gregg did. I’ve power-sanded the teardrop trailer to within an inch of its life and now I’ve masked it off, getting ready to paint it. 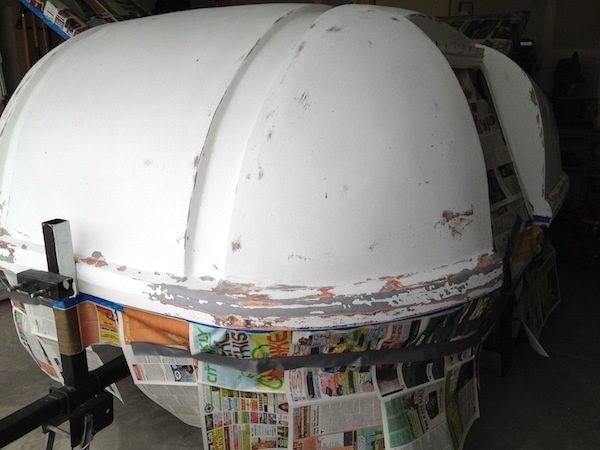 I am sore from all the sanding, crouching and stretching. It’s a better workout than I’ve had in a long time. 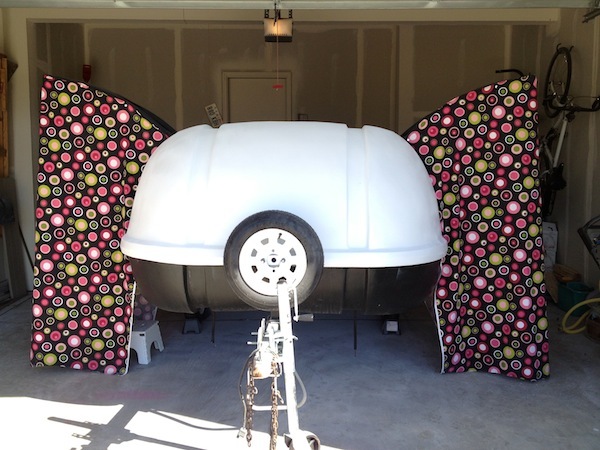 Mike and I have finished painting the teardrop trailer and I finished sewing the awnings. 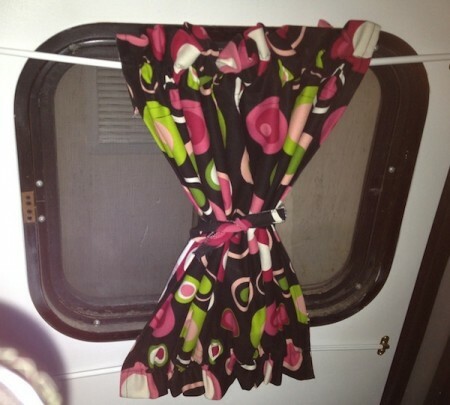 I’ve finished adding the curtains to our Teardrop American Outbacker. They stay put even when the door is open. I lined them, so they look good from the outside AND inside. 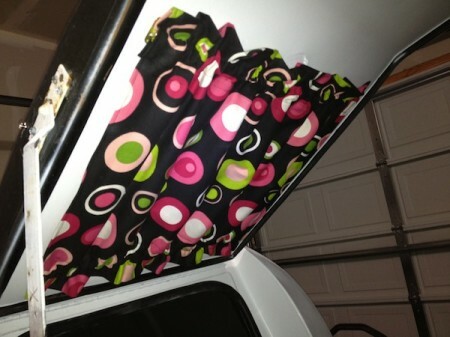 I also added a tie (permanently attached) so that we can open them when we want light or ventilation. I’m a little worried that the curtain rods bow so much in the middle when I tie them up, but we will probably leave them closed most of the time, so I’ve decided to not worry about it unless it is a problem when we’re camping. I also made a couple of throw pillows out of the same material, but we haven’t gotten a mattress yet, so they’ll have to wait. 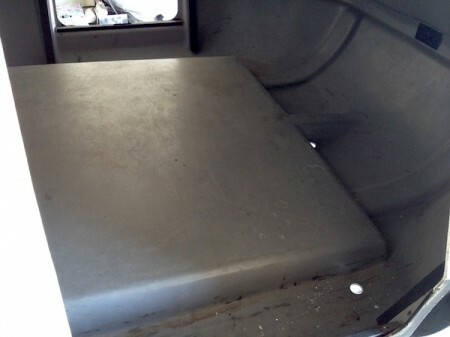 We measured the bed space and it’s approximately 70″ wide by 78″ long. That’s just barely too small for a California King, so we’re going to go with a Queen sized mattress. 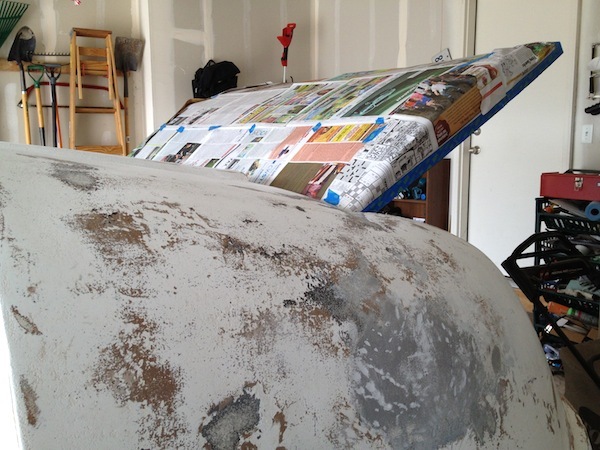 But, first, we have to do the water test to make sure the weather stripping will keep out the rain. Update 05-07-12: We took the trailer camping last weekend and EVERY ONE of those stupid curtain rods broke. The ends popped off each of them, making the curtains fall. I’m going to replace the rods with something more substantial. 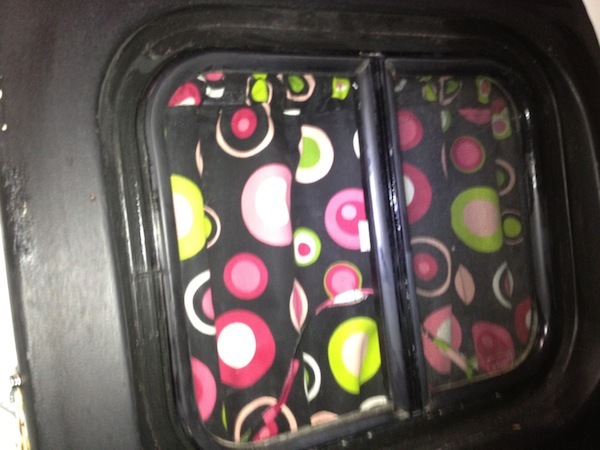 Note to self: If you are a little worried about something (like bending curtain rods), fix it BEFORE you go camping. Trying to deal with that stuff while we were at the campground was more difficult than it would have been if I had just solved the problem at home.